Today we have another product to review today from Bacula Systems. Its product's name is Bacula Enterprise. You perhaps know the community version of Bacula which is free, but this review highlights the features present in the enterprise version, which has a wide range of plugins, and enterprise-level support. Bacula Enterprise is compatible with and can backup environments running Hyper-V, VMware, Red Hat Virtualization, KVM, Xen, and Proxmox. This is a very large choice of hypervisors indeed, and Bacula has also this week announced native integration for backing up Docker. It can back up physical systems running Windows, Linux or Mac OS X. It is a server product which can be installed on different Linux distros x32/x64, FreeBSD, Solaris, but also as “client” on Windows, MacOS X, or other Unix/BSD systems. Bacula Enterprise is especially scalable and is extensible via plugins allowing to backup different types of infrastructures (including virtual), a range of high-end databases and ERP systems such as SAP which simplifies backup and restore of SAP using traditional SAP database tools. Backup and restore of individual objects of Microsoft Active Directory (AD) is also available via an external plugin as well, including the ability to backup MS Exchange Server, MS SQL Server, Postgre SQL or Oracle. The product is destined for enterprises and service providers backing up a large number of VMs, DBs and enterprise applications. Bacula Enterprise can do Full, Incremental, Differential backups or a ‘virtual-full’ backup. You can backup to local disks, NAS, SAN, tapes, autochanger or cloud. The software is natively integrated with Amazon S3, Azure, Google Cloud and Oracle Cloud backup software for the enterprise, and uses a unique caching system for more efficient retrieval of data from the cloud. By its architecture, Bacula is designed for larger enterprises, service providers, hosting companies or software providers. The product is very extensible and customizable, and can be specifically adapted to different environments. The software has five main components where each of those has a specific role. Director – The main engine which supervises all the backup, restore, verify and archive operations. 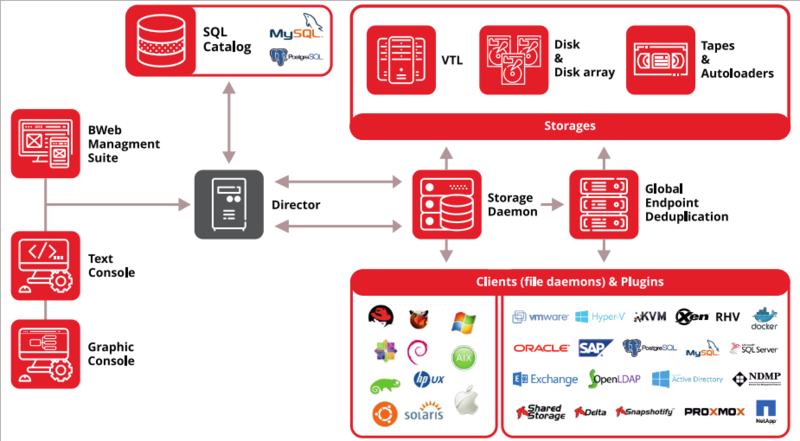 Storage Deamon – is the software that performs the storage of the file attributes and data to the physical backup media. File Daemon or Client – this one is installed on each machine to be backed up. Catalog – The database back-end used for storing backups and metadata, responsible for maintaining the file indexes for all files backed up. a text-based console interface, called BConsole. a web interface, called BWeb Management Suite. Overview of the whole Bacula Enterprise architecture. Backup types – Full, Incremental, Differential backups or ‘virtual-full’ backup option. Cloud Backup – it first finishes the local backup and then transfers the data from the local cache to the cloud. Tape Backup – support for VTL, during the installation, you have a choice to install VTL. Replication – also called Offsite backup. Offsite backup is the replication of the data to a server which is separated geographically from a production systems site. Offsite backup may also be done via direct access, over Wide Area Network (WAN). Restore Options – single file restores, full VM restore, Bare Metal Restore (recovery tool is available for both Linux and Windows Server). Also Single mailbox recovery (Exchange). Deduplication, compression – the software has a very efficient deduplication engine allowing you to benefit from shorter backup times (chunks are transferred to the destination only once) and storage space reduction. Bacula cuts files into chunks. Every chunk is stored and indexed in the deduplication engine (DedupEngine). In addition to deduplication, a compression engine is used to combine deduplication and compression to further reduce the storage space needed. Deduplication also speeds up restore speeds. You can have a look at this extended features list on Bacula System’s web page. 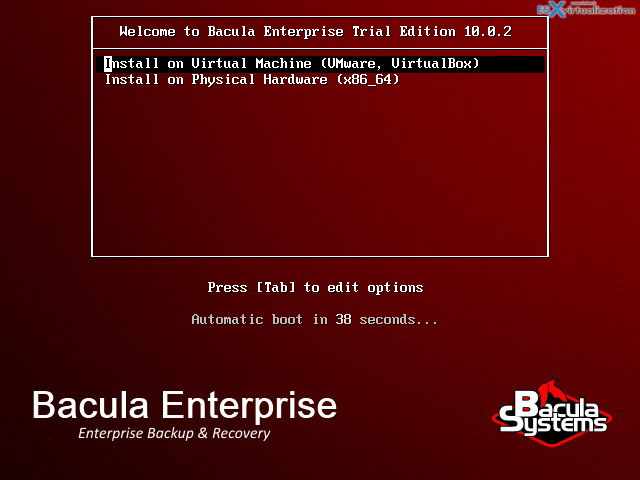 Bacula Enterprise has a very small footprint and it is highly configurable. I've tested the product installation via a Kickstart ISO containing CentOS Linux and Bacula Systems backup product so you have a choice to boot this iso into a VM or install it on a physical host with direct SAN access for maximum performance. As a backup target, the best would be a physical system, separated from virtual infrastructure, if of course, the environment to backup is full or partly virtual. The installation is pretty straightforward if you're familiar with Linux installers so you have to manually define the keyboard layout, time zone, storage pools and these kinds of things before the installation starts. 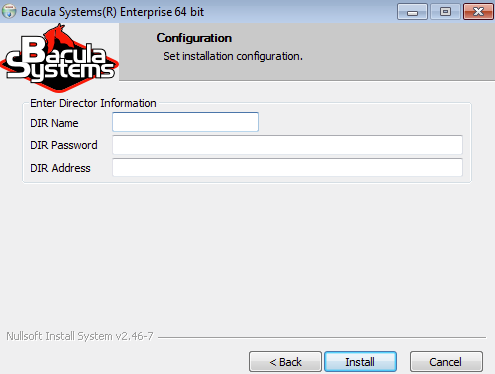 Bacula Enterprise installer starts the installation once the CentOS installer has finished the OS installation. The start screen, once you boot the ISO, looks like this. A simple choice between the installation in a VM or installation on a physical system. The product uses internal Postgre SQL Database installed during the installation. The trial edition has both BWeb Management Suite and BConsole, which are here to give you an opportunity to use graphical or command line user interfaces (UI) and configure and execute your backup/restoration jobs. Like most backup software, you'll have to create a backup job first, in order to back up a system. The Kickstart guide is well done and can walk you through perfectly. I just pasted a few examples of the screens from there, to give you an idea of how it looks. As you can see, there is an assistant that guides you through. However, the system you want to backup has to have an agent (daemon) installed first. Depending of the Operating system (OS) you'll have to install Windows or Linux agent first. 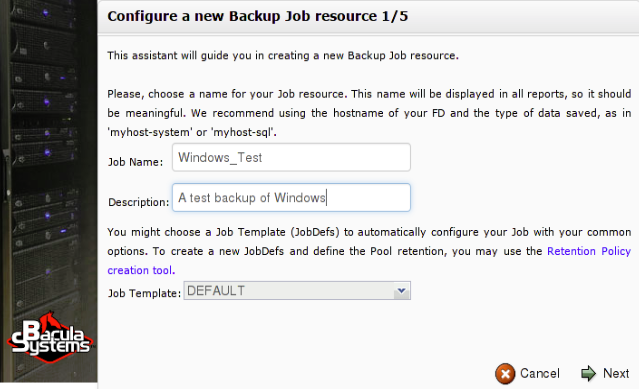 Once you have both in place, the backup job can be executed and backup the system according to the schedule. Bacula Enterprise has a built-in scheduler which is flexible and allows setting up different schedules for the backup job to run. You can also execute certain commands or scripts (Bash, Python, Perl, etc.) before or after the backup itself. You can define when the command or script should be executed (before or after) and you can also define what should happen if the command/script fails. Bacula Systems is the commercial version of the Bacula open source project, providing training and consulting services. So they are provisioning expert support services and the Bacula Enterprise Edition software. Both are provided through the Bacula Systems Subscription. 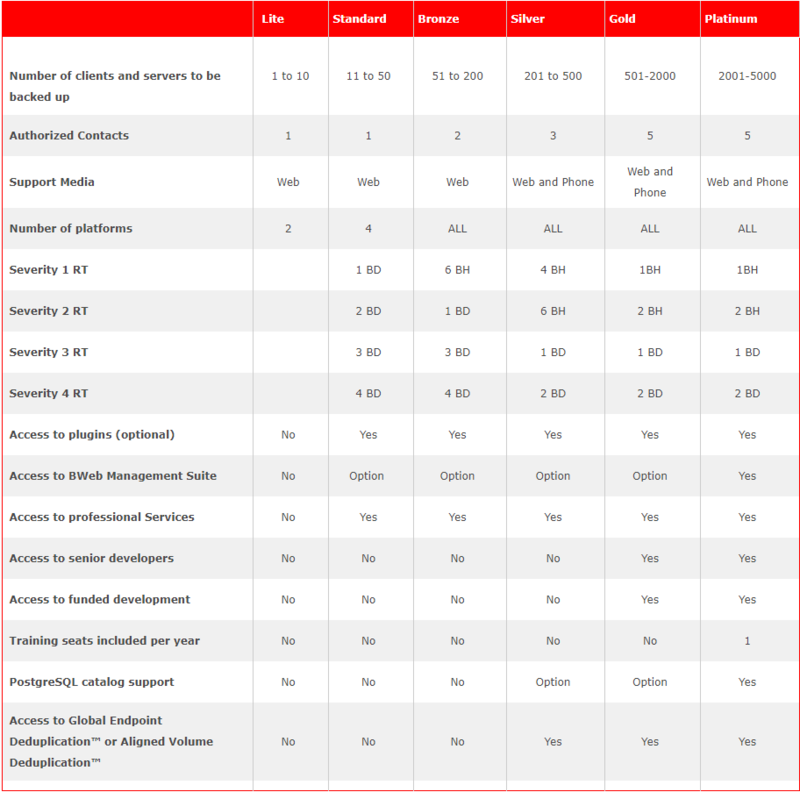 The subscription licensing model includes both the software and support services. One of the advantages of this product is certainly the extensibility where Bacula has developed and maintains a large choice of plug-ins which can be used to work with every operating system and backup device. The advantage of this modular approach is that the only pay for what you use. All updates and patches can be downloaded at no cost. Everything is included in the annual subscription plan. There are no license costs involved as such. Regarding pricing, what’s most important is that Bacula does not charge by data volume. So the bigger your business, the more competitive Bacula’s prices become. Bacula Customer support portal is available to customers which can reach directly to the support staff if needed. Create a ticket, and you can track support requests in real time. Customers a put in direct touch with senior experts. It is through this support portal where you also download all software updates and patches for the product. 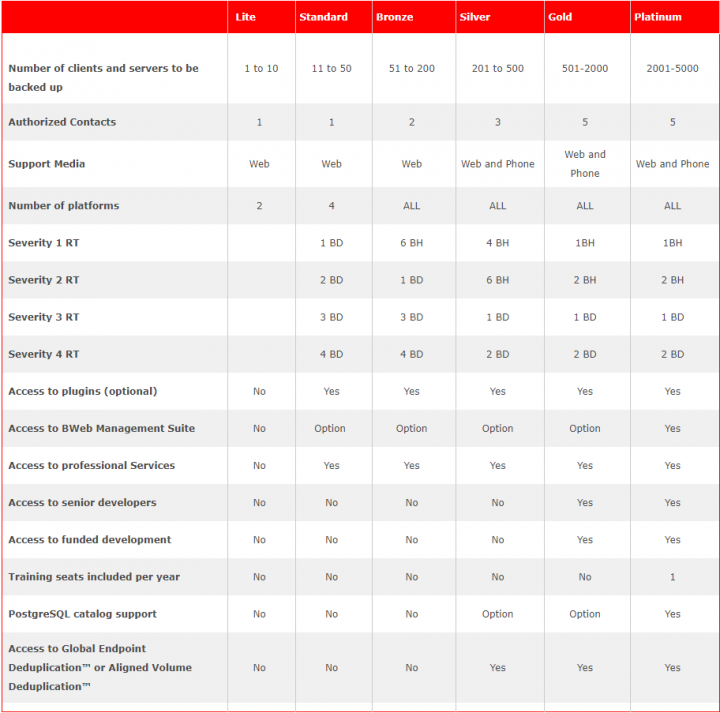 The support levels are numerous, and are essentially based on how any servers the user has. Small businesses often start with Lite, larger deployments are covered by either Standard, Bronze, Silver, Gold or Platinum. Check out the different support levels here. Bacula Enterprise has everything that enterprise level backup product should have. A VM-level backup, compatibility with multiple operating system platforms (Linux, Windows, AIX, Unix …) and databases (PSQL, Mysql, Oracle, SQLServer). In this short review, we just scratched the surface. There is much more information about Bacula Enterprise backup at their website and if you want to test the product, they have specific resources dedicated to that. Bacula Enterprise backup allows you to manage your backups from a single console where you create new jobs, monitor existing jobs or make changes. Bacula Enterprise software is able to backup and sync with Microsoft Azure blob storage or with Amazon Web Services (AWS) S3 storage. It's efficient and saves you money because it uses a local cache to seek for bits before reaching to the cloud to download the bits which are missing. The cache keeps some of your cloud-based backups synchronized on premises. Like this they will be immediately used, otherwise, they will be downloaded from the cloud as needed. The restore starts with Cloud Volume parts already in the local cache but will wait in turn for any part that needs to be downloaded. The downloads proceed in the background while the restore is running. You can test the product if you download the Trial Kickstart and then to start the installation. The Trial Kickstart is limited to 30 days. Please note that this review was sponsored by Bacula Systems.